"M4A1" and "Colt M4" redirect here. For other uses, see M4 (disambiguation). Magazines with different capacities also available. The M4 is also capable of mounting the M203 and M320 grenade launchers. The distinctive step in its barrel is for mounting the M203 with the standard hardware. The M4 has semi-automatic and three-round burst firing modes (like the M16A2 and M16A4), while the M4A1 has semi-automatic and fully automatic firing modes (like the M16A1 and M16A3). Following the adoption of the M16 rifle, carbine variants were also adopted for close quarters operations. The CAR-15 family of weapons served through the Vietnam War. However, these rifles had design issues, as "the barrel length was halved" to 10 inches, which "upset the ballistics", reducing its range and accuracy and leading "to considerable muzzle flash and blast, so that a large flash suppressor had to be fitted". "Nevertheless, as a short-range weapon it is quite adequate and thus, [despite] its caliber, [the XM177 'Commando'] is classed as a submachine gun." In 1984, Colt began work on a new carbine design called the XM4 combining the best features of the Colt Commando and later the M16A2 rifles. In 1984, the first model was made, and it was tested in May 1985. The first models had an upper receiver with an A1 sight, and were given a shorter 11.5-inch barrel, but later ones were given a longer 14.5-inch barrel for the bayonet and the M203 Grenade Launcher. The second model was made in May 1986, and it was tested from May 1986 though May 1987; at the time it had an A2 Upper Sight, and it had the M16A2's 1:7 inch rifle twist, to use the heavier 62-grain M855 rounds. The extended barrel improved the XM4's ballistics, reduced muzzle blast and gave the XM4 the ability to mount a bayonet and the M203 grenade launcher. The XM4 was also given the cartridge deflector, as well as other minor refinements. In May 1991, the XM4 was renamed to the M4, and Colt made a manual. The M4 was officially accepted into service by the U.S. military in 1994, and first saw action in the hands of U.S. troops deployed to Kosovo in 1999 in support of the NATO-led KFOR peacekeeping force. It would subsequently be used heavily by U.S. forces during the Global War on Terrorism, including Operation Enduring Freedom and Operation Iraqi Freedom. In the U.S. Army, the M4 had largely replaced M16A2s as the primary weapon of forward deployed personnel by 2005. The M4 carbine also replaced most submachine guns and selected handguns in U.S. military service, as it fires more effective rifle ammunition that offers superior stopping power and is better able to penetrate modern body armor. 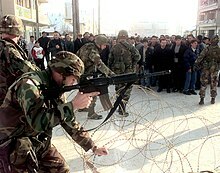 A U.S. Army 82nd Airborne soldier holds an M4 carbine in Vitina, Kosovo in January 2000 during the NATO-led KFOR mission, the first operational use of the M4 by U.S. troops. The United States Marine Corps has ordered its officers (up to the rank of Lieutenant Colonel) and staff non-commissioned officers to carry the M4 carbine instead of the M9 handgun. This is in keeping with the Marine Corps doctrine, "Every Marine a rifleman". The Marine Corps, however, chose the full-sized M16A4 over the M4 as its standard infantry rifle. United States Navy corpsmen E5 and below are also issued M4s instead of the M9. While ordinary riflemen in the Marine Corps were armed with M16A4s, M4s were fielded by troops in positions where a full-length rifle would be too bulky, including vehicle operators and fireteam and squad leaders. As of 2013, the U.S. Marine Corps had 80,000 M4 carbines in their inventory. By July 2015, major Marine Corps commands were endorsing switching to the M4 over the M16A4 as the standard infantry rifle, just as the Army had done. This is because of the carbine's lighter weight, compact length, and ability to address modern combat situations that happen mostly within close quarters; if a squad needs to engage at longer ranges, the M27 IAR can be used as a designated marksman rifle. Approval of the change would move the M16 to support personnel, while armories already had the 17,000 M4s in the inventory needed to outfit all infantrymen who needed one. In October 2015, Commandant Robert Neller formally approved of making the M4 carbine the primary weapon for all infantry battalions, security forces, and supporting schools in the U.S. Marine Corps. The switch was to begin in early 2016 and be completed by September 2016. In December 2017, the Marine Corps revealed a decision to equip every Marine in an infantry squad with the M27, replacing the M4 in that part of the service. MARSOC will retain the M4, as its shorter barrel is more suited to how they operate in confined spaces. On 1 July 2009, the U.S. Army took complete ownership of the M4 design. This allowed companies other than Colt to compete with their own M4 designs. The Army planned on fielding the last of its M4 requirement in 2010. On 30 October 2009, Army weapons officials proposed a series of changes to the M4 to Congress. Requested changes included an electronic round counter that records the number of shots fired, a heavier barrel, and possibly replacing the direct impingement system with a gas piston system. The benefits of this, however, have come under scrutiny from both the military and civilian firearms community. According to a PDF detailing the M4 Carbine improvement plans released by PEO Soldier, the direct impingement system would be replaced only after reviews were done comparing the direct impingement system to commercial gas piston operating system to find out and use the best available operating system in the U.S. Army's improved M4A1. In September 2010, the Army announced it would buy 12,000 M4A1s from Colt Firearms by the end of 2010, and would order 25,000 more M4A1s by early 2011. The service branch planned to buy 12,000 M4A1 conversion kits in early 2011. In late 2011, the Army bought 65,000 more conversion kits. From there the Army had to decide if it would upgrade all of its M4s. 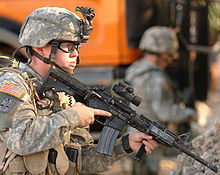 On 21 April 2012, the U.S. Army announced to begin purchasing over 120,000 M4A1 carbines to start reequipping front line units from the original M4 to the new M4A1 version. The first 24,000 were to be made by Remington Arms Company. Remington was to produce the M4A1s from mid-2013 to mid-2014. After completion of that contract, it was to be between Colt and Remington to produce over 100,000 more M4A1s for the U.S. Army. Because of efforts from Colt to sue the Army to force them not to use Remington to produce M4s, the Army reworked the original solicitation for new M4A1s to avoid legal issues from Colt. On 16 November 2012, Colt's protest of Remington receiving the M4A1 production contract was dismissed. Instead of the contract being re-awarded to Remington, the Army awarded the contract for 120,000 M4A1 carbines worth $77 million to FN Herstal on 22 February 2013. The order is expected to be completed by 2018. The M4 product improvement program (PIP) is the effort by the U.S. Army to modernize its inventory of M4 service rifles. Phase I consists of converting and replacing regular M4s with the M4A1 version. This variant of the rifle is fully automatic and has a heavier barrel, and is given ambidextrous fire controls. Phase II of the PIP explored developing a new bolt carrier. 11 designs were submitted. The competition was scheduled to conclude in summer 2013, but ended in April 2012. Over six months of testing revealed that the current bolt carrier assembly outperformed the competing designs, especially in the areas of reliability, durability, and high-temp and low-temp tests. Phase II also includes a competition for a free-floating forward rail assembly. The Army may award contracts to up to three finalists in early 2013, with the selection of a final winner in early 2014. If the Army determines that the winning rail system should be procured, delivery of new rail is anticipated by the summer of 2014. In March 2015, the Army launched a market survey to see what the small-arms industry could offer to further enhance the M4A1 to an "M4A1+" standard. Several upgrade options include an extended forward rail that will allow for a free-floated barrel for improved accuracy with a low-profile gas block that would do away with the traditional triangular fixed front sight, removable front and rear flip-up back-up iron sights, a coyote tan or "neutral color" rail for reduced visual detection, a more effective flash suppressor/muzzle brake, an improved charging handle, and a new single-stage trigger module. In June 2016, the M4A1+ was canceled after reviewing the offerings and determining that there were no major upgrades currently offered. The M4 and its variants fire 5.56×45mm NATO (and .223 Remington) ammunition, and are gas-operated, magazine-fed, selective fire firearms with either a multi-position telescoping stock or a fixed A2 or LE tactical stock. The M4 is a shorter and lighter variant of the M16A2 rifle, with 80% parts commonality. The M4 is similar to much earlier compact M16 versions, such as the 1960s-era XM177 family. Some of those visual similarities are obvious in both weapons. As with many carbines, the M4 is handy and more convenient to carry than a full-length rifle. The price is slightly inferior ballistic performance compared to the full-size M16, with its 5.5" (14 cm) longer barrel. This becomes most apparent at ranges of 200 yards (180 m) and beyond. While the M4's maneuverability makes it a candidate for non-infantry troops (vehicle crews, clerks and staff officers), it also makes it ideal for close quarters battle (CQB). The M4, along with the M16A4, have mostly replaced the M16A2 in the Army and Marines. The U.S. Air Force, for example, has transitioned completely to the M4 for Security Forces squadrons, while other armed personnel retain the M16A2. 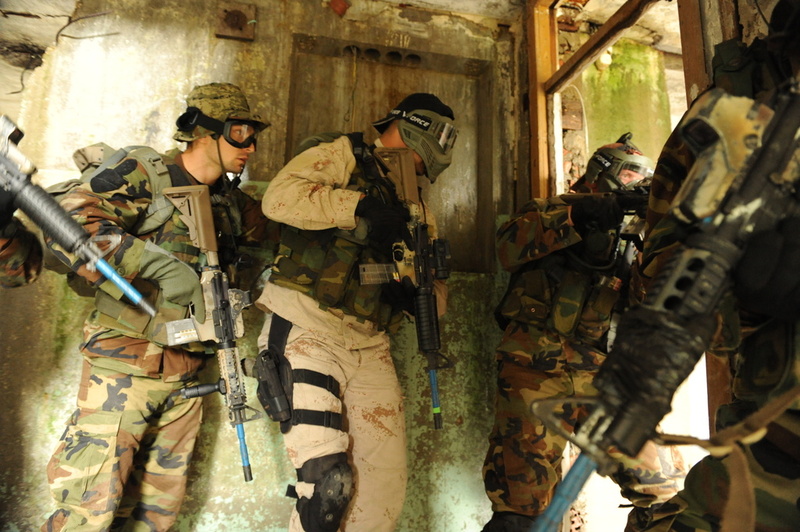 The US Navy uses M4A1s for Special Operations and vehicle crews. Shortened barrel 14.5 in (370 mm), which includes the shorter carbine gas system. However, there have been some criticisms of the carbine, such as lower muzzle velocities and louder report due to the shorter barrel, additional stress on parts because of the shorter gas system, and a tendency to overheat faster than the M16A2. Like all the variants of the M16, the M4 and the M4A1 can be fitted with many accessories, such as night vision devices, suppressors, laser pointers, telescopic sights, bipods, either the M203 or M320 grenade launchers, the M26 MASS shotgun, forward hand grips, and anything else compatible with a MIL-STD-1913 Picatinny rail. Other common accessories include the AN/PEQ-2, AN/PEQ-15 multi-mode laser, AN/PEQ-16 Advanced Combat Optical Gunsight (ACOG), and M68 CCO. EOTech holographic weapon sights are part of the SOPMOD II package. Visible and IR (infrared) lights of various manufacturers are also commonly attached using various mounting methods. As with all versions of the M16, the M4 accepts a blank-firing attachment (BFA) for training purposes. In January 2017, a USMC unit deployed with suppressors mounted to every infantry M4 service weapon. Exercises showed that having all weapons suppressed improved squad communication and surprise during engagements; disadvantages included additional heat and weight, increased maintenance, and the greater cost of equipping so many troops with the attachment. M4 feedramps are extended from the barrel extension into the upper receiver. This can help alleviate feeding problems that may occur as a result of the increased pressure of the shortened gas system of the M4. This problem is primarily seen in full-auto applications. U.S. Special Operations Command (USSOCOM) developed the Special Operations Peculiar Modification (SOPMOD) Block I kit for the carbines used by units under its jurisdiction. The kit features an M4A1, a Rail Interface System (RIS) handguard developed by Knight's Armament Company, a shortened quick-detachable M203 grenade launcher and leaf sight, a KAC sound suppressor, a KAC back-up rear sight, an Insight Technologies AN/PEQ-2A visible laser/infrared designator, along with Trijicon's ACOG TA-01NSN model and Reflex sights, and a night vision sight. This kit was designed to be configurable (modular) for various missions, and the kit is currently in service with special operations units. A second-generation SOPMOD kit (now known as SOPMOD II) includes innovative optics, such as the Elcan Specter DR, Trijicon's ACOG TA01 ECOS model, and the Eotech 553. Block II uses the RIS II rails manufactured by Daniel Defense in both a 9.5 and 12.5 length. Except for the very first delivery order, all U.S. military-issue M4 and M4A1 carbines possess a flat-top NATO M1913-specification (Picatinny) rail on top of the receiver for attachment of optical sights and other aiming devices—Trijicon TA01 and TA31 Advanced Combat Optical Gunsights (ACOG), EOTech 550 series holographic sights, and Aimpoint M68 Close Combat Optic (M68 CCO) being the favorite choices—and a detachable rail-mounted carrying handle. Standards are the Colt Model 920 (M4) and 921 (M4A1). Variants of the carbine built by different manufacturers are also in service with many other foreign special forces units, such as the Australian Special Air Service Regiment (SASR). While the SASR uses weapons of essentially the same pattern built by Colt for export (Colt uses different models to separate weapons for the U.S. military and those for commercial/export purposes), the British SAS uses a variant on the basic theme, the Colt Canada (formerly Diemaco) C8SFW. Colt Model 925 carbines were tested and fitted with the Knight's Armament Corporation (KAC) M4 RAS under the designation M4E2, but this designation appears to have been scrapped in favor of mounting this system to existing carbines without changing the designation. The U.S. Army Field Manual specifies for the Army that adding the Rail Adapter System (RAS) turns the weapon into the M4 MWS or Modular Weapon System. The M4A1 carbine is a fully automatic variant of the basic M4 carbine intended for special operations use. The M4A1 was introduced in May 1991, and was in service in 1994. The M4A1 has a "S-1-F" (safe/semi-automatic/fully automatic) trigger group, while the M4 has a "S-1-3" (safe/semi-automatic/3-round burst) trigger group. The M4A1 is used by almost all U.S special operation units including, but not limited to, Marine Force Recon, Army Rangers, Army Special Forces, Navy SEALs, United States Air Force Pararescue and Air Force Combat Control Teams. It has a maximum effective range of about 500 to 600 meters (550–660 yd). The fully automatic trigger gives a more consistent trigger pull, which leads to better accuracy. According to Mark A. Westrom, owner of ArmaLite, Inc., automatic fire is better for clearing rooms than burst fire. In the last few years, M4A1 carbines have been refitted or received straight from the factory with barrels with a thicker profile under the handguard. This is for a variety of reasons such as heat dissipation during full-auto, and accuracy as a byproduct of barrel weight. These heavier barrel weapons are also fitted with a heavier buffer known as the H2. Out of three sliding weights inside the buffer, the H2 possesses two tungsten weights and one steel weight, versus the standard H buffer, which uses one tungsten weight and two steel weights. These weapons, known by Colt as the Model 921HB (for Heavy Barrel), have also been designated M4A1, and as far as the government is concerned the M4A1 represents both the 921 and 921HB. Conversion of M4s to the M4A1 began in 2014, the start of all U.S. Army forces being equipped with the automatic variant. Though in service with special forces, combat in Afghanistan showed the need for providing automatic suppression fires during fire and movement for regular soldiers. The 101st Airborne Division began fielding new-built M4A1s in 2012, and the U.S. 1st Infantry Division became the first unit to convert their M4s to M4A1-standard in May 2014. Upgrades included a heavier barrel to better dissipate heat from sustained automatic firing, which also helps the rifles use the M855A1 EPR that has higher proof pressures and puts more strain on barrels. The full-auto trigger group has a more consistent trigger pull, whereas the burst group's pull varies on where the fire control group is set, resulting in more predictable and better accuracy on semi-automatic fire. Another addition is an ambidextrous selector lever for easier use with left-handed shooters. The M4-M4A1 conversion only increases weapon weight from 7.46 lb (3.38 kg) to 7.74 lb (3.51 kg), counting a back-up iron sight, forward pistol grip, empty magazine, and sling. Each carbine upgrade costs $240 per rifle, for a total cost of $120 million for half a million conversions. Three conversions can be done per day to equip a brigade combat team per week, with all M4A1 conversions to be completed by 2019. The Mk 18 Close Quarters Battle Receiver is an M4A1 with a 10.3-inch barrel upper receiver. Current contractors for the Mark 18 are Colt and Lewis Machine & Tool (LMT) NSN 1005-01-527-2288. For the Individual Carbine competition, Colt submitted their Enhanced M4 design, also known as the Colt Advanced Piston Carbine (APC). The weapon has a suppression-ready fluted barrel, which is lighter and cools better than previous M4 barrels. It is claimed to have "markedly better" accuracy. To improve reliability, Colt used an articulating link piston (ALP), which "reduces the inherent stress in the piston stroke by allowing for deflection and thermal expansion". In traditional gas piston operating systems, the force of the piston striking the bolt carrier can push the bolt carrier downwards and into the wall of the buffer tube, leading to accelerated wear and even chipped metal. This is known as carrier tilt. The ALP allows the operating rod to wiggle to correct for the downward pressure on the bolt and transfers the force straight backwards in line with the bore and buffer assembly, eliminating the carrier tilt. This relieves stress on parts and helps to increase accuracy. The Individual Carbine competition was canceled before a winning weapon was chosen. Though Colt has focused its attention on carbines with 14.5-inch barrels and rifles with 20-inch barrels, Colt continues to make carbines with 11.5-inch barrels, which it calls Commandos. The Colt Model 733, is their first design, and it was made in 1987. It was referred to as the M16A2 Commando, and later the M4 Commando. Unlike the XM177, the Colt Commando was a shorter variant of the M16A2. Originally, Commandos were assembled from whatever spare parts are available, so Model 733 Commandos could have A1-style upper receivers with case deflectors or A2-style upper receivers, and M16A1-profile 1:7 or M16A2-profile 1:7 barrels. Depending on the specific models, Commandos may have had three-position fire control groups (safe/semi-automatic/three-round burst), or four-position having both full-automatic and burst. The modern Model 933 has a "flattop" receiver, with a removable carrying handle and a MIL-STD-1913 Picatinny rail, with semi-automatic and automatic fire. The Model 935 Commando has the features of the Model 933, but has three-round burst fire instead of automatic. Though originally called the M16A2 Commando, Colt markets them as the M4 Commando around 1995. In 2014, American firearms designer Jim Sullivan provided a video interview regarding his contributions to the M16/M4 family of rifles when working for Armalite. A noted critic of the M4, he illustrates the deficiencies found in the rifle in its current configuration. In the video, he demonstrates his "Arm West LLC modified M4", with enhancements he believes necessary to rectify the issues with the weapon. Proprietary issues aside, the weapon is said to borrow features in his prior development, the Ultimax. Sullivan has stated (without exact details as to how) the weapon can fire from the closed bolt in semi-automatic and switch to open bolt when firing in fully automatic, improving accuracy. The weight of the cyclic components of the gun has been doubled (while retaining the weapon's weight at less than 8 pounds). Compared to the standard M4, which in automatic fires 750-950 rounds a minute, the rate of fire of the Arm West M4 is heavily reduced both to save ammunition and reduce barrel wear. The reduced rate also renders the weapon more controllable and accurate in automatic firing. 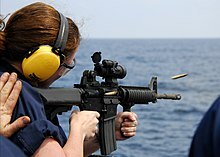 A U.S. Navy sailor fires an M4 carbine from the warship USS Vella Gulf. The M4 carbine has been used for close quarters operations where the M16 would be too long and bulky to use effectively. It has been a compact, light, customizable, and accurate weapon. This has come at the cost of reliability and maintainability. Failure to maintain the M4 causes malfunctions. This became apparent as it saw continued use in the sandy environments of Iraq and Afghanistan. Despite this, in post-combat surveys, 94 percent of soldiers rated the M4 as an effective weapons system. By late 2002, 89 percent of U.S. troops reported they were confident with the M4, but they had a range of problems. 34 percent of users said the handguards rattled and became excessively hot when firing, and 15 percent had trouble zeroing the M68 Close Combat Optic. 35 percent added barber brushes and 24 percent added dental picks to their cleaning kits. There were many malfunctions, including 20 percent of users experiencing a double feed, 15 percent experiencing feeding jams, and 13 percent saying that feeding problems were due to magazines. 20 percent of users were dissatisfied with weapon maintenance. Some had trouble locking the magazine into the weapon and having to chamber a round in order to lock the magazine. Soldiers also asked for a larger round to be able to kill targets with one shot. New optics and handguards made usage of the M4 easier, and good weapon maintenance reduced the number of misfeeds. In December 2006, the Center for Naval Analyses released a report on U.S. small arms in combat. The CNA conducted surveys on 2,608 troops returning from combat in Iraq and Afghanistan over the past 12 months. Only troops who fired their weapons at enemy targets were allowed to participate. 917 troops were armed with M4 Carbines, making up 35 percent of the survey. 89 percent of M4 users (816 troops) reported they were satisfied with the weapon. 90 percent (825 troops) were satisfied with handling qualities such as handguards, size, and weight. M4 users had the highest levels of satisfaction with weapon performance, including 94 percent (862 troops) with accuracy, 92 percent (844 troops) with range, and 93 percent (853 troops) with rate of fire. Only 19 percent of M4 users (174 troops) reported a stoppage, and 82 percent of those that experienced a stoppage said it had little impact on their ability to clear the stoppage and re-engage their target. 53 percent of the M4 users (486 troops) never experienced failures of their magazines to feed. 81 percent (743 troops) did not need their rifles repaired while in theater. 80 percent (734 troops) were confident in the M4's reliability, defined as level of soldier confidence their weapon will fire without malfunction, and 83 percent (761 troops) were confident in its durability, defined as level of soldier confidence their weapon will not break or need repair. Both factors were attributed to high levels of soldiers performing their own maintenance. 54 percent of M4 users offered recommendations for improvements. 20 percent of requests were for greater bullet lethality, and 10 percent was better quality magazines, as well as other minor recommendations. Some M16 users expressed their desire to be issued the M4. Some issues have been addressed with the issuing of the improved STANAG magazine in March 2009, and the M855A1 Enhanced Performance Round in June 2010. In the fall 2007, the Army tested the M4 against three other carbines in "sandstorm conditions" at Aberdeen Proving Ground, Maryland: the Heckler & Koch XM8, Fabrique Nationale de Herstal SOF Combat Assault Rifle (SCAR) and the Heckler & Koch HK416. Ten of each type of rifle were used to fire 6,000 rounds each, for a total of 60,000 rounds per rifle type. The M4 suffered far more stoppages than its competitors: 882 stoppages, 19 requiring an armorer to fix. The XM8 had the fewest stoppages, 116 minor stoppages and 11 major ones, followed by the FN SCAR with 226 stoppages and the HK416 with 233. Despite 863 minor stoppages—termed "class one" stoppages, which require 10 seconds or less to clear, or "class two" stoppages, which require more than ten seconds to clear—the M4 functioned well, with over 98 percent of the 60,000 total rounds firing without a problem. The Army said it planned to improve the M4 with a new cold-hammer-forged barrel to give longer life and more reliable magazines to reduce the stoppages. Magazine failures caused 239 of the M4's 882 failures. Army officials said the new magazines could be combat-ready by spring if testing went well. The Army began issuing an improved STANAG magazine in March 2009. According to the Army, the M4 only suffered 296 stoppages, and said that the high number reported could be attributed to discrepancies in the scoring process. The Army testing command stated that, if the number of stoppages caused by a broken part met some threshold, they would be eliminated from the final report pending redesign of the part. Colt also claimed that the testing conditions were unfair to the M4, as the M4s used in the test were normal guns from active inventory, with remaining service life varying randomly. Further, the trial M4s had burst-mode fire groups, which are more complicated and prone to failure than the fully automatic fire groups the other manufacturers presented for testing. There were three extreme dust tests performed in 2007. The 2nd Summer 2007 results showed a large difference from the later fall test with the M4 having 148 class 1 stoppages due to rifle malfunctions and 148 class 1 stoppages due to magazine stoppages. The full-size M16 rifle had 61 stoppages during the same extreme dust test. In early 2010, two journalists from the New York Times spent three months with soldiers and Marines in Afghanistan. While there, they questioned around 100 infantrymen about the reliability of their M4 Carbines, as well as the M16 rifle. Troops did not report to be suffering reliability problems with their rifles. While only 100 troops were asked, they fought at least a dozen intense engagements in Helmand Province, where the ground is covered in fine powdered sand (called "moon dust" by troops) that can stick to firearms. Weapons were often dusty, wet, and covered in mud. Intense firefights lasted hours with several magazines being expended. Only one soldier reported a jam when his M16 was covered in mud after climbing out of a canal. The weapon was cleared and resumed firing with the next chambered round. Furthermore, a Marine Chief Warrant Officer reported that there were no issues with his battalion's 700 M4s and 350 M16s. The reliability of the M4 has increased as the design was upgraded. In 1990, the M4 was required to fire 600 mean rounds between stoppages using M855 ammunition. In 2013, the current M4A1 version can fire 1,691 mean rounds between stoppages using M855A1 ammunition. During the 2009 Marine Corps Infantry Automatic Rifle testing, the Colt IAR displayed a MRBS of CLASS I/II Stoppages of 952 rounds, with a MRBEFF of Class III Stoppages of 60,000 rounds. An array of firearms accessory makers have offered gas piston conversion kits for the M4. The claimed benefits include less needed lubrication for the bolt carrier group to run reliably and reduced fouling. The argument against it is increased weight and reduced accuracy. The Enhanced M4 uses an articulating link piston operating system. Complicating the Army search for higher reliability in the M4 is a number of observations of M4 gas piston alternatives that suffer unintended design problems. The first is that many of the gas piston modifications for the M4 isolate the piston so that piston jams or related malfunction require the entire weapon be disassembled, such disassembly cannot be performed by the end user and requires a qualified armorer to perform out of field, whereas almost any malfunction with the direct-impingement system can be fixed by the end user in field. The second is that gas piston alternatives use an off-axis operation of the piston that can introduce carrier tilt, whereby the bolt carrier fails to enter the buffer tube at a straight angle, resulting in part wearing. This can also tilt the bolt during extraction, leading to increased bolt lug failures. The third is that the use of a sound suppressor results in hot gases entering the chamber, regardless of a direct-gas impingement or gas piston design choice. The gas piston system may also cause the firearm to become proprietary to the manufacturer, making modifications and changes with parts from other manufacturers difficult. The M4 was developed and produced for the United States government by Colt Firearms, which had an exclusive contract to produce the M4 family of weapons through 2011. However, a number of other manufacturers offer M4-like firearms. Colt previously held a U.S. trademark on the term "M4". Many manufacturers have production firearms that are essentially identical to a military M4, but with a 16" barrel. The Bushmaster M4 Type Carbine is a popular example. Civilian models are sometimes colloquially referred to as "M4gery" (/ɛmˈfɔːrdʒəri/ em-FOR-jər-ee, a portmanteau of "M4" and "forgery"). Colt had maintained that it retains sole rights to the M4 name and design. Other manufacturers had long maintained that Colt had been overstating its rights, and that "M4" had now become a generic term for a shortened AR-15. In April 2004, Colt filed a lawsuit against Heckler & Koch and Bushmaster Firearms, claiming acts of trademark infringement, trade dress infringement, trademark dilution, false designation of origin, false advertising, patent infringement, unfair competition, and deceptive trade practices. Heckler & Koch later settled out of court, changing one product's name from "HK M4" to "HK416". However, on December 8, 2005, a District court judge in Maine granted a summary judgment in favor of Bushmaster Firearms, dismissing all of Colt's claims except for false advertising. On the latter claim, Colt could not recover monetary damages. The court also ruled that "M4" was now a generic name, and that Colt's trademark should be revoked. Afghanistan: Used by Afghan Army commandos. M4s sold as part of a 2006 Foreign Military Sales package. Additional M4s sold as a 2008 Foreign Military Sales package. Albania: Used by Albanian Land Force 2015. Antigua and Barbuda: M4/M4A1s announced to be sold via FMS program in 2017. Australia: Used by the Special Operations Command, Clearance Divers. Bangladesh: Used by Bangladesh Army Paracommandos, Dhaka Metropolitan Police SWAT teams and Special Warfare Diving And Salvage. Bahrain: M4A1s sold as a 2008 Foreign Military Sales package. More M4/M4A1s announced to be sold via FMS program in 2017. Belize: M4s/M4A1s sold as part of a 2006 Foreign Military Sales package. More M4/M4A1s announced to be sold via FMS program in 2017. Bosnia & Herzegovina: M4A1s used by the military and air guard units. Brazil: Used by Civil Police of Espirito Santo State, Military Police of Espirito Santo State, Military Police of Rio de Janeiro State, the Brazilian Federal Police and Special Forces of the Brazilian Army and Brazilian Navy. Canada: Used by various police units. License made copies continue to be developed by Colt Canada, a successor to DIEMACO, and are known collectively as the C8 carbine. Croatia: User since 2003, several hundred purchased for Croatian ISF contingent as well as special forces in Croatia. Czech Republic: Bushmaster M4A3 B.M.A.S. is used by (601st Special forces group, Military police, 43rd Airborne mechanized battalion) of Czech Army. China: Unlicensed copies made by Norinco as the Norinco CQ. CQ-A carbine variant used by the Sichuan Police Department, Chongqing SWAT teams, and the Snow Leopard Commando Unit. Colombia: M4A1s as part of a 2008 Foreign Military Sales. More M4/M4A1s announced to be sold via FMS program in 2017. Ecuador: M4s sold as a 2008 Foreign Military Sales package. El Salvador: M4s sold as part of a 2007 Foreign Military Sales package. Additional M4s sold as a 2008 Foreign Military Sales package. Georgia: Bushmaster M4s being replaced by Colt M4s for the military. More M4/M4A1s announced to be sold via FMS program in 2017. Greece: Used by EKAM, All SF Army, Navy, Airforce units. Hungary: M4A1 SOPMOD by Hungarian MH 34th Bercsényi László special operation battalion More M4/M4A1s announced to be sold via FMS program in 2017. India: M4A1s as part of a 2008 Foreign Military Sales. M4A1 is used by the Mizoram Armed Police, PARA, MARCOS, Garud and Force One of the Mumbai Police. Indonesia: Used by Detachment 88 Counter-terrorism Police Squad operators. Also used by Komando Pasukan Katak (Kopaska) tactical diver group and Komando Pasukan Khusus (Kopassus) special forces group. Iraq: Used by the Iraqi Army. Main weapon of the Iraqi National Counter-Terrorism Force. More M4/M4A1s announced to be sold via FMS program in 2017. Israel: Sold as part of a January 2001 Foreign Military Sales package to Israel. Jamaica: M4s sold as part of a 2007 Foreign Military Sales package. Japan: M4A1s as part of a 2008 Foreign Military Sales package. M4A1 SOPMOD rifles are in use by the Japanese Special Forces Group. Jordan: M4s sold as part of a 2007 Foreign Military Sales package. Additional M4s sold as a 2008 Foreign Military Sales package. More M4/M4A1s announced to be sold via FMS program in 2017. Kenya: Used by Kenyan troops in AMISCOM ops. Lebanon: M4 components being sold to Lebanese special forces. M4/M4A1s sold as a 2008 Foreign Military Sales package. More M4/M4A1s announced to be sold via FMS program in 2017. Liberia: Used by Liberian Emergency Response Unit. Nepal: 1,070 M4s, sold as part of a 2005 Foreign Military Sales package. New Zealand: Used by NZSAS operators and standard issue to New Zealand Police including Special Tactics Group and Armed Offenders Squad units. North Macedonia: M4s sold as a 2008 Foreign Military Sales package. Pakistan: M4A1 variant used by the Special Forces fo the Pakistani military besides the POF G3P4 standard rifle for the Pakistani military— also used by the Special Security Unit (SSU) of the Sindh Police. More M4/M4A1s announced to be sold via FMS program in 2017. Panama: M4A1s sold as a 2008 Foreign Military Sales package. More M4/M4A1s announced to be sold via FMS program in 2017. Philippines: Colt M4/M4A1s sold as a 2008 Foreign Military Sales package. New orders for 63,000 R4A3 rifles from Remington Arms for the Philippine Army and the Philippine Marine Corps. Several units also used by the Defense Intelligence and Security Group. Poland: Used by Wojska Specjalne military unit JW Grom. Portugal: Used by Marines special forces DAE (Destacamento de Acções Especiais). Romania: M4/M4A1s announced to be sold via FMS program in 2017. Russia: Used in limited quantities by FSB Alpha. Senegal: M4/M4A1s announced to be sold via FMS program in 2017. Serbia: Used by various police units. Singapore: Used by the Singapore Armed Forces Commando Formation and the Police Coast Guard (only the Port Squadron and the Coastal Patrol Squadron) of the Singapore Police Force. Slovakia: M4/M4A1s announced to be sold via FMS program in 2017. Thailand: M4A1s sold as part of a 2006 Foreign Military Sales package. Tonga: M4/M4A1s sold as a 2008 Foreign Military Sales package. Tunisia: Used by the Tunisian Army's Special Forces Group (GFS), 51st Infantry Navy Commandos Regiment, Presidential Guard and various National Guard and Police special forces units. Uganda: Used by Ugandan troops in AMISCOM ops. United Arab Emirates: Purchased 2,500 M4 carbines in 1993. Yemen: M4s sold as part of a 2006 Foreign Military Sales package. Sales of select-fire or fully automatic M4s by Colt are restricted to military and law enforcement agencies. No private citizen can own an M4 in a select-fire or fully automatic configuration, as this model of fully automatic rifle was developed after the 1986 ban on full automatic weapons available to be purchased by US citizens under the Firearms Owners' Protection Act of 1986. While many machine guns can be legally owned with a proper tax stamp from the Bureau of Alcohol, Tobacco, Firearms and Explosives, an amendment to the Firearm Owners Protection Act of 1986 barred the transfer to private citizens of machine guns made or registered in the U.S. after May 19, 1986. The only exception was for Special Occupational Taxpayers (SOT), who are licensed machine gun dealers with demonstration letters, manufacturers, and those dealing in exports and imports. As such, only the earliest Colt M4 prototypes built prior to 1986 would be legal to own by non-SOT civilians. The modular nature of the AR-15 design, however, makes it relatively simple to fit M4-specific components to a "pre-'86" select-fire AR-15 lower receiver, producing an "M4" in all but name. The M4 falls under restrictions of Title II of the National Firearms Act. The 14.5 inch barrel makes the M4 a Short Barrel Rifle (SBR) and select fire capability (semi-automatic and full automatic or burst-automatic) makes the M4 a machine gun. Civilian replicas of the M4 typically have 16 inch barrels (or standard 14.5 inch M4 barrels with permanently attached flash suppressors with a total length of 16 inches) and are semi-automatic-only to meet the legal definition of a rifle under the Gun Control Act. Civilian-legal M4s are also popular with police as a patrol carbine. ^ a b Small Arms Survey (2007). "Armed Violence in Burundi: Conflict and Post-Conflict Bujumbura" (PDF). The Small Arms Survey 2007: Guns and the City. Cambridge University Press. p. 204. ISBN 978-0-521-88039-8. ^ SabahDaily. "Intruders photo in Sabah" (in Malay). Archived from the original on 2013-03-06. Retrieved 2013-03-02. ^ "Arming the Maute Group in Marawi City - The Firearm Blog". 22 June 2017. ^ Curtis, Rob (2012-04-20). "U.S. Army places order for 24,000 M4A1 carbines with Remington". Militarytimes.com. Retrieved 2012-08-23. ^ Colt M4 Carbine Technical Specifications. Colt. ^ "M855A1 Enhanced Performance Round (EPR), LTC Philip Clark, Product Manager Small Caliber Ammunition, April 2012" (PDF). Archived from the original (PDF) on 2017-01-25. Retrieved 2017-02-25. ^ a b "M-4 Carbine". U.S. Army Fact Files. United States Army. Retrieved 2008-09-13. ^ "Commandant approves M4 as standard weapon for Marine infantry". ^ Times, Marine Corps. "404". Archived from the original on 2014-12-18. ^ "New Assignment Rationale for Individual Weapons" Archived 2014-11-29 at the Wayback Machine. U.S. Marine Corps, June 22, 2007. ^ Marine Raiders don't want any M27s Marine Corps Times. 19 February 2018. ^ a b Matthew Cox (2009-07-07). "Army acquires rights to M4". Army Times. Retrieved 2009-08-18. ^ Matthew Cox (2009-11-21). "Major revamp possible for M4 carbine". Army Times. Retrieved 2009-11-21. ^ a b Mike Pannone (2010-03-19). "The Big M4 Myth: "Fouling caused by the direct impingement gas system makes the M4/M4A1 Carbine unreliable."". Defensive Review. Retrieved 2011-07-27. ^ Dan Lamothe. "Corps to pass on Army upgrades to M4". Marine Corps Times. Archived from the original on 25 September 2010. Retrieved 13 September 2010. ^ "Army Wants Upgrades to Improve M4A1 Carbine's Performance, Accuracy". Military.com, 18 March 2015. ^ "Animation of the gas system of the M4 carbine". Militarytimes.com. Archived from the original on 2009-12-28. Retrieved 2010-08-30. ^ "The Design & Development of the M-4 Carbine". Special Operations.com. Archived from the original on 2008-10-25. Retrieved 2008-11-08. ^ Lance M. Bacon (30 April 2011). "Improved carbines headed your way". Army Times. Retrieved 30 April 2011. ^ Johnson, Jeff. "CQB Receiver – M4A1 Carbine with10-Inch Upper Receiver". Power point presentation, Scribd.com. US Naval Surface Warfare Center Crane. Retrieved 2 May 2012. ^ Lowe, Christian (2007-12-18). "M4 Carbine Fares Poorly in Dust Test". Military.com. Military Advantage. Retrieved 2008-09-13. ^ "...And Here's the Rest of the M4 Story". Defense Tech. Military Advantage. 2007-12-18. Archived from the original on 2007-12-23. Retrieved 2008-09-13. ^ Cox, Matthew (2007-12-19). "Newer carbines outperform M4 in dust test". Army Times. Army Times Publishing Company. Retrieved 2008-09-13. ^ Cox, Matthew (2007-12-17). "M4 may get tougher barrel, better mags". Army Times. Army Times Publishing Company. Retrieved 2008-09-13. ^ "15259frcov.fm" (PDF). Archived from the original (PDF) on 2015-08-31. Retrieved 2010-08-30. ^ a b "Malaysia has licence to make M4 assault rifles". The Star. 2007-11-05. Archived from the original on 2008-10-03. Retrieved 2010-03-22. ^ a b David Watters. "The 5.56 X 45mm: 2005". Archived from the original on 2011-08-07. Retrieved 2010-03-10. ^ "FindLaw's United States First Circuit case and opinions". Findlaw. Retrieved 2016-08-09. ^ "OpenJurist synopsis of denial of Colt's appeal to 08 Dec 2005 ruling". Openjurist.org. Retrieved 2010-08-30. ^ Petty Officer First Class David Votroubek (July–August 2008). "New Gear for Afghan Commandos". United States Army Logistics Management College. Retrieved 2009-03-24. ^ Soraya Sarhaddi Nelson (2007-07-23). "New Afghan Commandos Take to the Frontlines". National Public Radio. Retrieved 2009-03-24. ^ a b c d Daniel Watters. "The 5.56 X 45mm: 2006". Archived from the original on 2011-03-01. Retrieved 2009-03-25. ^ a b c d e f g h i j k l m n Daniel Watters. "The 5.56 X 45mm: 2008". The Gun Zone. Archived from the original on 2010-01-04. Retrieved 2009-01-27. ^ "FOTOT/ Ushtria shqiptare tregon "dhëmbët"". Gazeta Tema. Archived from the original on 2015-12-23. Retrieved 2016-01-06. ^ a b c d e f g h i j k l m n o "Colt Capitalizes on Foreign Military Sales Program - The Firearm Blog". 27 April 2017. ^ Clearance Divers. Defence Jobs. Retrieved 2011-09-27. ^ "Dhaka Metropolitan Police SWAT - Overview". bdmilitary. Retrieved 22 February 2009. ^ "Bangladesh Military Forces - BDMilitary.com". Bangladesh Military Forces - BDMilitary.com. Retrieved 15 November 2014. ^ "DOU 05/07/2012 - Pg. 28 - Seção 3 - Diário Oficial da União - Diários JusBrasil". JusBrasil. Retrieved 15 November 2014. ^ "Soldiers from the Dominican Republic Special Forces fire the M4 Carbine rifle at targets down range at the shooting house in Sierra Piedras, Dominican Republic". nara.getarchive.net. 20 April 2004. ^ a b c Daniel Watters. "The 5.56 X 45mm: 2007". Archived from the original on 2008-10-10. Retrieved 2009-03-25. ^ Rottman, Gordon L. (20 December 2011). The M16. Weapon 14. Osprey Publishing. p. 60. ISBN 978-1-84908-691-2. ^ Sof, Eric (22 April 2017). "Colt wins multimillion contract to sell M4 Carbines to Georgia, Iraq". Archived from the original on 2018-07-22. Retrieved 2018-06-03. ^ a b c Binnie, Jeremy; de Cherisey, Erwan (2017). "New-model African armies" (PDF). Jane's. Archived from the original (PDF) on 22 June 2017. ^ "Greece Ministry of Public Order Press Office: Special Anti-Terrorist Unit" (PDF). Official Website of the Hellenic Police. July 2004. Archived from the original (PDF) on 2010-07-21. Retrieved 2009-10-13. ^ "34. Bercsény László Különleges Műveleti Zászlóalj" [Bercsény László 34th Special Operations Battalion]. Archived from the original on October 18, 2017. Retrieved June 22, 2017. ^ Mizo cops to get foreign weapons. Meghalayatimes.info (2010-06-13). Retrieved 2011-09-27. ^ Bill Guerin (2007-06-16). "Another success for Detachment 88". Asia Times Online. Retrieved 2009-01-20. ^ "Kopassus & Kopaska – Specijalne Postrojbe Republike Indonezije" (in Croatian). Hrvatski Vojnik Magazine. Archived from the original on August 22, 2010. Retrieved 2010-06-12. ^ Joseph Giordono (2007-05-16). "Iraqi soldiers switching over to M-16s and M-4s". Stars & Stripes. Retrieved 2009-03-25. ^ CJSOTF-AP Public Affairs. "U.S. Special Forces, Iraqi army ops: Raids result in 102 detainees, large weapons cache, no losses" (PDF). p. 8. Retrieved 2009-03-25. ^ Daniel Watters. "The 5.56 X 45mm: 2000–2001". Archived from the original on 2008-10-10. Retrieved 2009-03-25. ^ 全文掲載：飯柴大尉の声明文 (in Japanese). Retrieved 2009-01-12. ^ Christopher J. Castelli (September 2008). "Department of Defense to equip Lebanon's Special Forces with Small Arms, Vehicles" (PDF). DISAM Journal. Retrieved 2009-02-08. ^ Thompson, Leroy (December 2008). "Malaysian Special Forces". Special Weapons. Retrieved 2009-12-17. ^ "Legacies of War in the Company of Peace: Firearms in Nepal" (PDF). Nepal Issue Brief. Small Arms Survey (2): 5. May 2013. ^ Daniel Watters. "The 5.56 X 45mm: 2005". Archived from the original on 2011-08-07. Retrieved 2009-03-25. ^ "Unofficial New Zealand Special Air Service page". Retrieved 2009-03-25. ^ "Split second decisions: police rules of engagement". The Sunday Star-Times. 1 February 2009. Retrieved 15 October 2011. ^ "Replacement due for police rifles". New Zealand Police. 19 May 2005. Retrieved 8 March 2016. ^ "Pakistan Army". Archived from the original on May 13, 2013. ^ "U.S. Army Weapon Systems Handbook 2012" (PDF). Retrieved 2013-04-25. ^ Adnan Abu Amer (2015-05-10). "Security services drain Palestine's budget". Al-Monitor. Archived from the original on 2017-05-05. Retrieved 2017-06-08. ^ "Philippine Army acquires R4 carbines". Archived from the original on March 29, 2014. Retrieved 15 November 2014. ^ "US-based Remington wins bid to supply 50,000 M4 rifles for AFP, company rep says". Interaksyon.com. Archived from the original on May 6, 2013. Retrieved May 4, 2013. ^ "Small Arms Repair and Upgrade Unit". Bullet-in. June 2015. ^ Sebastian Miernik. "//- Strona poświęcona Wojskowej Formacji Specjalnej GROM -//". Grom.mil.pl. Archived from the original on 2011-08-14. Retrieved 2010-08-30. ^ "Portugal – Destacamento de Ações Especiais (DAE)". Tropaselite.t35.com. Archived from the original on 2010-08-20. Retrieved 2010-08-30. ^ "Спецподразделение "Группа "Альфа" ФСБ РФ. История, с иллюстрациями". Archived from the original on 2016-12-10. ^ "Kalibar | Tekst". Kalibar.rs. Retrieved 2010-08-30. ^ "Singapurske Specijalne Postrojbe" (in Croatian). Hrvatski Vojnik Magazine. Archived from the original on October 15, 2009. Retrieved 2009-10-25. ^ 屏東縣警察局保安隊 裝備介紹 Archived 2008-05-18 at the Wayback Machine. Ptpolice.gov.tw (2007-01-29). Retrieved 2011-09-27. ^ "Colt contracted for M4, M4A1 rifles for foreign military sales". UPI. Retrieved 2018-09-21. ^ "Colt M4 Carbine - Assault Carbine - History, Specs and Pictures - Military, Security and Civilian Guns and Equipment". Retrieved 15 November 2014. ^ Daniel Watters. "The 5.56 X 45mm: 1990–1994". Archived from the original on 2010-01-04. Retrieved 2009-03-25. 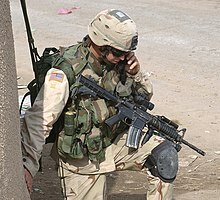 Wikimedia Commons has media related to M4 carbine.